We are one of the dominant manufactures and suppliers of Scaffolds-Form Work. We use all modern techniques in the manufacturing of our world class products. We proffer unique and unparalleled products at acceptable price. The Reliance Form work system consists of all steel economy panels. These are available in a combination of sizes from 75mm to 600mm wide and 900mm to 3000mm long. Special sizes can also be made to order. The panels are joined by wedge sets which are inserted through slots in the punched flat which forms the edge of the panel. The panels are aligned by either tube or channel walers which are clamped to the panels with "B" or "C" clamps. For heavyduty concrete work soldiers are used. The panels are then gangformed and crane handled. The panels are tied together to form parallel faces using UniSpan's proprietary tie systems. Stiffeners are built into the panel, therefore only two scaffold tube or channel wafers are required for alignment. Can easily be erected by unskilled labour. Durable steel face plate cannot be damaged by vibrators or penetrated by the reinforcing steel. Wall forms and channel soldiers of 45*45*5mm are manufactured out of M.S slotted angles and 12g M.S sheets to make them rigid and strong. Curvature of wailing tubes are changed to suit profiles of different diameter shells. Consists of wallform panels made out of 12 gauge Sheet and M.S. Angel/Flat Frame, channel/ Heavy Duty Soldiers, Tubular/Channel walers & accessories. Panels supplied in 1.25m & Soldiers in 2.5m heights. For curved walls flexible panes are used, and heavy duty soldiers to be used in place of channel soldiers for single sided shuttering. Double Adjuster Panel, Splay Panel, inter Corner Panel, External Corner Angle and Lap Angle etc., as also wallform accessories like Single clip, Double clip, Bridge clip, Assembly bolt and wedge / clip etc. are used for various applications of conventional wallform shuttering. SIE water stopper is compatible with 17mm tie rods, for achieving water tight ties.Water stoppers are made from high quality casting and have a plastic caps at both ends, special feature is an additional surrounding disc for better Anchoring and further security against penetrating water. SIE water stoppers are optimal choice for contractors. 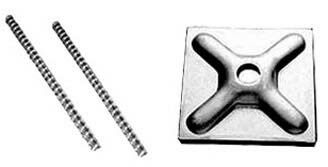 SIE Counter Plate for typical tie bar application with wing nuts and tie rods. Reinforced design, made from steel. waller plates/Counter Plates are for use both with timber and steel framework. waller plates/Counter Plates are of square dimensions of 120x120mm, an opening hole to pass through tie rods and additional mailing holes for timber framework if required. waller plates/Counter Plates are available with or without galvanizing. Knock—on wing nuts with two wings, compatible with tie rods. Wing Nuts are a typical component of the Tie bar system and are suitable for both timber and steel from work, when waller plates/Counter Plates are used. Zinc plated for rust protection. Available in our different designs with and without flange, with one or two wings. ICP's come in a full range of lengths forming internal corner between a drop beam and slab soffit as well as vertical corers. Filler plates fill in gaps when using non-standard modules and facilitate stripping in confined areas.